Obtaining health coverage can be enormously difficult for childless North Carolinians of modest income. In North Carolina, they are not eligible for Medicaid. Add to this the fact that many have a difficult time paying for private insurance and that several jobs do not offer employer-sponsored health insurance and it’s a wonder that any are insured. The General Assembly’s Medicaid Blockade just makes matters worse. What’s even more frustrating about this situation is that many childless adults in the coverage gap have been mislabeled as undeserving “able-bodied” adults. Opponents of Medicaid expansion ignore the fact that 56 percent of adults in the coverage gap are employed. Thus, they do have “skin in the game.” For families in the health insurance gap, more than 65 percent have a family member working at least part-time. The explanation for why so many employed people lack insurance are varied, but one of the most obvious is this: their employers don’t want to pay for it. And so instead of employing people full-time, they keep their employees trapped in the “gig economy.” A report in the most recent issue of the journal Health Affairs examines this problem. The researchers note that many employers are shifting to contract workers or other types of temporary employees. So even though someone may have a “job,” he or she may have no access at all to employer-sponsored health coverage. Dorothy is a home health aide and a classic example of this destructive phenomenon. Though she works hard taking are of vulnerable people, she along with 500,000 other North Carolinians, remain mired in the coverage gap. 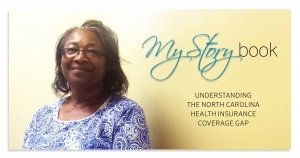 Legislators who continue to push the Medicaid Blockade should understand that workers, like Dorothy, who actually help provide health care to others, are stuck in the coverage gap. Even though Dorothy takes care of her health and tries to be proactive with prevention, it is obviously not enough. Like everyone else, she needs decent and affordable health insurance. Opponents of Medicaid expansion should realize that workers need to be healthy in order to keep people working. When North Carolina has a healthy workforce, it will attract more employers and businesses to want to invest in our state and build up the labor market. Unfortunately, the supporters of the Medicaid Blockade continue to prevent North Carolinians from becoming healthy and more productive workers even, as in the case of Dorothy, when they got to work everyday attending to the health care needs of others.